You kind of liked the idea of that TEAC turntable that could rip vinyl right into a CD (though many of you seemed to wonder why it took so long for the combo to be marketed together), so you may also want to take a looksie at ION's ITTUSB. This USB turntable is being touted as the first ever of its kind to let you instantly convert your vinyl to CD or MP3 with included recording software (no special drivers required). Basically, the ITTUSB is compatible with any software that supports USB audio input sound cards, but comes with Audacity software for Mac or PC. 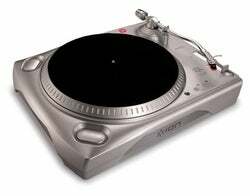 On the hardware side, the turntable supports 33 1/3 and 45rpm, has an adjustable anti-skating control for increased stereo balancing, supports high-speed vinyl recording, has adjustable pitch control (+/- 8 per cent) and comes with line level output that lets you connect to your home stereo with CD or auxiliary inputs. Just $139.